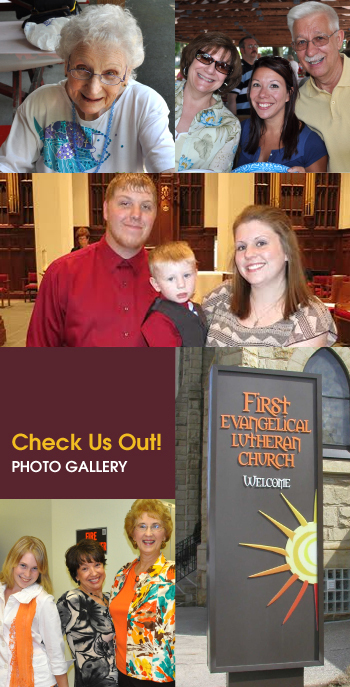 Welcome to the website for First Evangelical Lutheran Church in downtown Altoona. If you are a member, we hope you will find this site useful for staying informed and connected. If you are not a member, we hope that you will visit us in person; you are welcome anytime. We are one of more than 10,300 congregations within the 65 synods (ours is Allegheny Synod, www.alleghenysynod.org) that comprise the Evangelical Lutheran Church in America (www.elca.org). Established as a congregation in 1805, it wasn’t until 1896 that ground was broken for the original Gothic structure that is still our center of worship to this day. We are a congregation of younger and older adults, teens and children. We’re married and single, male and female. Many of us were born into this church while many others have been warmly welcomed from other denominations. While we have a core group who are very active, we also have many who participate only when they feel they are able. All are important to the life of this congregation and we happily lift up to God the time, talent and resources of each and every one.